You have received a bill that should look similar to the one below. Please use the information from YOUR bill in the fields below. Please enter date of service from your invoice. Please enter patients first name. Please enter patients last name. Please enter patients street address. Please enter patient phone number. Your email address will be used to verify any missing information and send you a copy of the form you are submitting. A typed name in the space for the signature is legally considered a signature under Minnesota Statues, Sections 325L.02, clause (h) and 325L.07, clause (d). Authorization for Billing / Release of Patient Information / Assumption of Financial Responsibility: I request that payment of authorized Medicare/Medicaid and/or other insurance benefits be made to the pre-hospital care provider ("Provider") for any services furnished to me. I authorize any holder of hospital or medical information about me to be released to the Provider, Centers for Medicare and Medicaid Services, and/or my insurance carriers and their agents, including any other information needed to determine these benefits or other benefits payable for related services. I permit a copy of this authorization to be used in place of the original. I understand this authorization may be used by the Provider for all services furnished in the future until such time as I revoke this authorization in writing. I agree to assume full financial responsibility for payment of all charges not covered by my insurance carrier as well as any collection costs and/or attorney's fees as allowed by law. 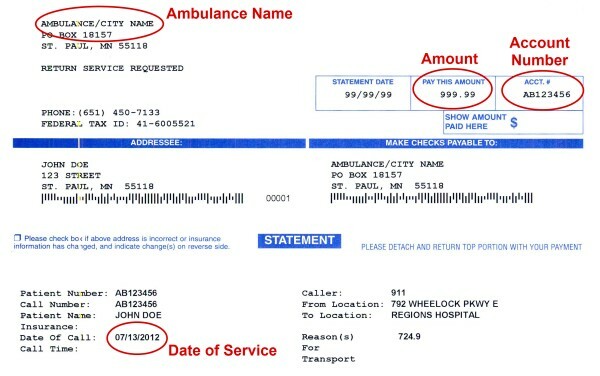 Copyright © EMS Patient Pay & TransMedic. All Rights Reserved.